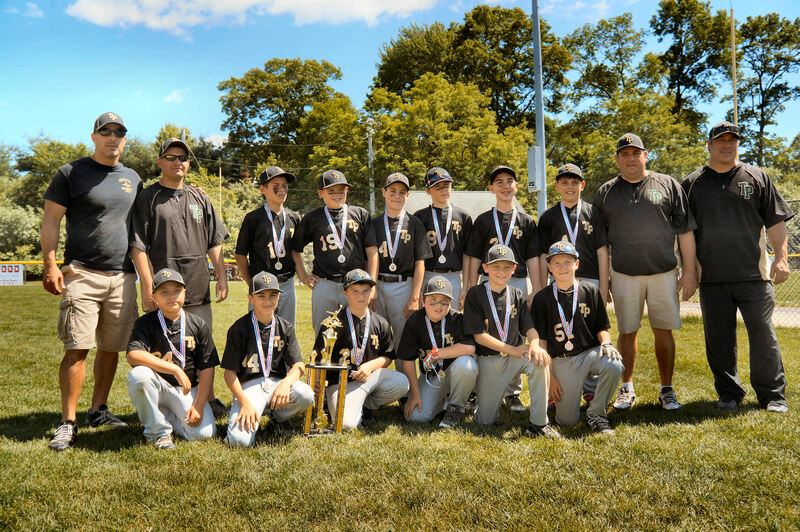 CLINTON, MASS - After starting the season with a 3-7 record, the Triple Play 11U Super team finished with a 22-10 mark and was 2014 New England AAU 11U Super Division runner-up. Triple Play advanced to the finals by earning a dramatic 4-3 victory over the Connecticut Mustangs when Jake Oblak hit a two-run walkoff homer in the bottom of the sixth. 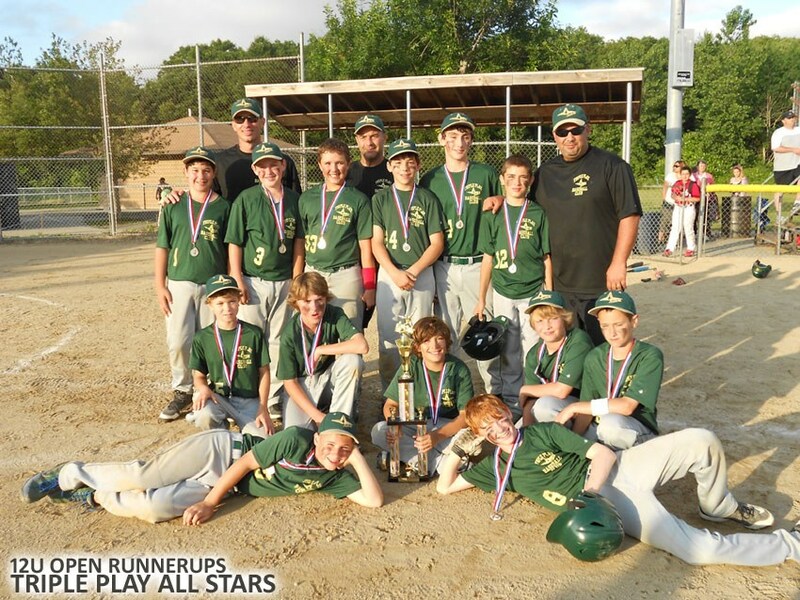 Triple Play came up short against the RI Riverdogs Blue, 7-5, in the finals. Triple Play had a 14-game winning streat at one point and went 19-3 over its final 22 games. Members of the team posed for a picture with the trophy on Sunday in Rhode Island. Members of the team include: (front row, left to right) Josh Mirob, Mario Bosco, William Casasanto, Greg Flanigan, Dylan Vigue, Ben Morris, (back row, left to right) assistant coach Carlo Bosco, head coach Chris Klingenberg, James Borsari, Connor Salmon, Teddy Durand, Sam Person, Jake Oblak, Jacob Elliott, assistant coach Chad Elliott and assistant coach Mike Vigue. 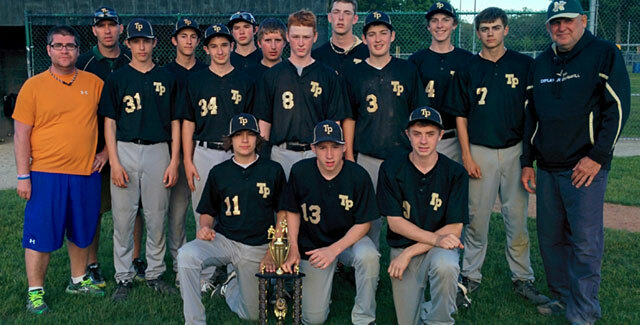 CLINTON, MASS - The Triple Play All Star Baseball Club 14U team finished as the runner-up in the 2014 14U NEAAU Memorial Weekend Classic. Leading into the championship game they were 3-0 in the qualifying rounds with outstanding pitching, great defense, timely hitting and great base running outscoring the three opponents 39-2. They made it to the finals by defeating the Cape Cod Buccaneers 11-1. Unfortunately the quest for them ended as they fell short losing in the final game 5-3. All games were at Slater and Veterans Park in Rhode Island. Nashoba ends season ranked 5th in the state by ESPN and 4th in the state by MAX Preps (as of 6/20/2013). LOWELL -- Nashoba Regional's magical ride through the postseason came to a disappointing end Saturday afternoon at LeLacheur Park. Bridgewater-Raynham senior left-hander Mike Bruemmel had a lot to do with that. Bruemmel was as good as advertised, masterfully baffling Nashoba for a two-hit shutout with 12 strikeouts in a 4-0 victory in the Division 1 state final. "The kid pitched a great game," Nashoba coach Chuck Schoolcraft said. "There's nothing you can do about it. He had us off-balance all day long, and whoever called the game over there did a really good job. We just couldn't hit the ball today. "These kids have nothing to hang their heads about. They had a great season." It was a historic season for the Nashoba (21-4) baseball program, which won its first district title during this memorable journey. STOW: For the first time in school history, the Chieftains brought some hardware back to Bolton when they plated the winning run in the bottom of the ninth inning on a Drew Foster sacrifice fly to give Nashoba a 2-1 victory over Leominster High in the Division Central sectional finals held at Tivnan Field in Worcester. The team previously beat fourth-seeded Wachusett Regional on Wednesday night in the semi-finals with a commanding 14-1 victory. The previously beat Algonquin 7-1 in the quarterfinals and now stand at 20-3 for the season. The team includes many former Triple Play AAU players from the program including Nick Borsari, Nick Campana, Matt Sabourin, Kevin Connelly, Mike Kane, John Militano, David Gauld, Ben Sousa, Charlie Ramsland, John Hannon, Max Ashline. There are also four other; Drew Foster, Jack Sarnoski, Jordan Edmonds and Derek Hinckley, who played in other AAU programs. 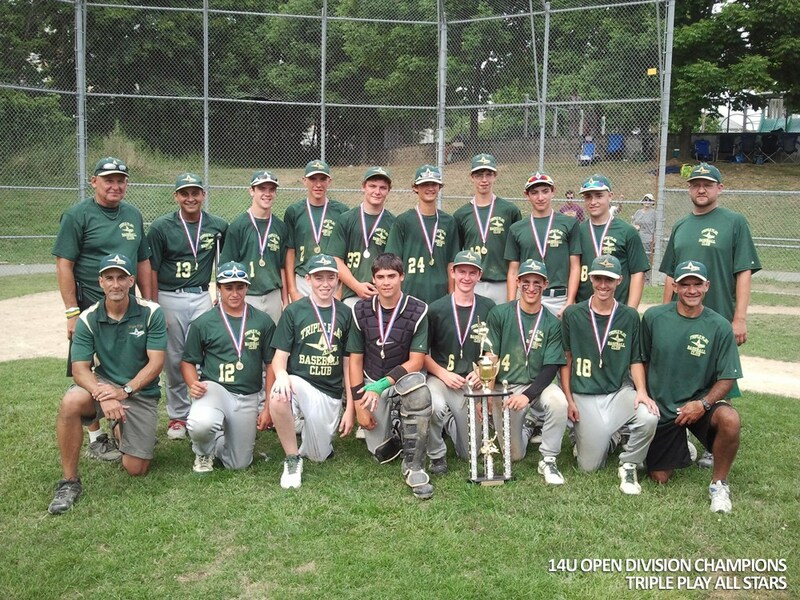 Clinton, MASS (July 16, 2012): The Triple Play All Star Baseball Club 14U team won the 2012 NEAAU Open Championship on Sunday 7/15/2012. Leading into the championship game they were 2-0 in the qualifying rounds with outstanding pitching, great defense, timely hitting and agressive base running. Team members include: Alex Borsari from Bolton – Nick Carlucci from Berlin – David Gauld from Sterling – Jacob Hicks, Ben Sousa and Derek Pasquale from Lancaster - Ethan Sprague from Harvard - Aaron Jacobson from Maynard - Jacob Logan from Westminster - Frankie Matos from Clinton - Morgan McSweeney from Hudson - Cam Plank from Marlborough - Luke Worthington from Southboro - and George Schmidt from Worcester. 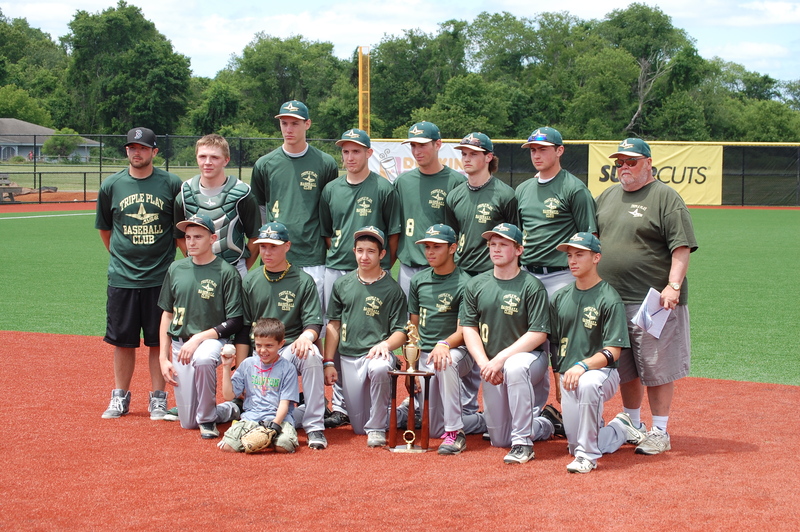 The coaching staff is lead by Chuck Schoolcraft Sr. with the help of assistants Joe Sousa, Scott Carlucci and Chuck Schoolcraft Jr.
Clinton, MASS (June 20, 2012): The Triple Play 16U Showcase team started its season by winning the 2012 EBL Legends Tournament. Hosted over two weekends, the 16U team went an impressive 7-1 to make it to the championship game on Sunday 6/17 held at the University of Rhode Island. Their championship run included some impressing wins such as a come from behind for a 9-8 victory against the New Hampshire Grizzlies with a walk-off hit to qualify for the championship game and a 7-0 win that had a combined no-hitter in qualifying play. The team won the final game verses Mass Pride Elite with outstanding play in the field, at the plate and on the mound shutting them out 8-0. We wish them continued success through out the summer season! Team members include - Nicholas Borsari, John Militano, Kevin Connelly and John Hannon from Bolton – James Adams from Hudson – Joe Jacobs from Concord – Richard Arms and Chris Steidler from Southborough – Robert Kirkpatrick from Sterling – Marcus Otis from Littleton – Tsuyoshi Koyama (not pictured) from Acton - Max Ashline and Josh Bahnick from Clinton. The coaching staff is lead by Fred McDonald with the help of assistant Cory McDonald. Clinton, MASS (June 20, 2012): The Triple Play All Star Baseball Club 12U team finished as the runner-up in the 2012 12U NEAAU Open Championship. Leading into the championship game they were 3-0 in the qualifying rounds with outstanding pitching, great defense, timely hitting and great base running. They made it to the finals by defeating the Lakeville Cardinals in a hard fought game 5-4. Unfortunately the quest for the championship ended in a close game as a sixth inning rally fell short and they lost to the Connecticut Bombers in a thrilling game 6-4 at Woodlake Complex in Johnston, Rhode Island. Team members include: Joey LaCroix from Boylston - George Khen (not pictured) from Clinton - Spencer Tingle (not pictured) from Harvard - Sam Stout, Andrew Lennox, Josh Hatch and Michael Chaves from Hudson - Rocco Pandiscio, Matthew Aronson, Bryce Parson, Cam Roberts and Nick Vautour from Leominster - Jack Ouellette from Marlborough - Christian Castriotta from Milford - Sam Welch from Worcester. The coaching staff was led by Mark Chiasson with the help of assistants Mike DiPietro and Greg Parson. CLINTON, MASS (December 12, 2011): Triple Play Batting Cages is excited to announce the addition of Kaitlin Andrews to the instruction staff. 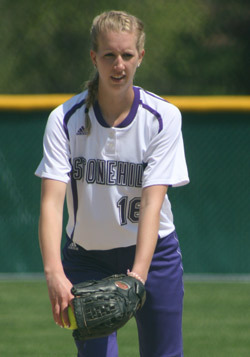 Andrews is the 2011-12 captain of the Stonehill College softball team. As a sophomore she made 19 appearances in the circle with 9 starts and compiled a 3-3 record with a 3.69 ERA. During the season she struck out 35 and walked just 10 in 66.1 innings of work, ranking second among NE-10 leaders for fewest walks allowed. As a junior she made 20 pitching appearances with 13 starts compiling a 6-6 record and was ranked second among NE-10 leaders with a 1.89 ERA. During the season she struck out 42 and walked just 13 in 81.1 innings of work. Andrews was a teammate of Coach Millett, captain of the 2007 D2 State Championship team and she holds the Hudson High single game and career strikeout records. Other high school accomplishments include 3 championship appearances (2006-2008), three district championships (2006-2008) and three Mid-Wach C Championships (2006-2008). Honors include Mid-Wach C All-Star (2006-2008), Mid-Wach C MVP (2007), Metrowest Daily News All-Star (2007-2008) and Worcester Telegram Superteam (2006-2008). She is available for group and individual pitching lessons. CLINTON, MASS (November 17, 2011): Triple Play Batting Cages is excited to announce the addition of Jamie Millett to the instruction staff. 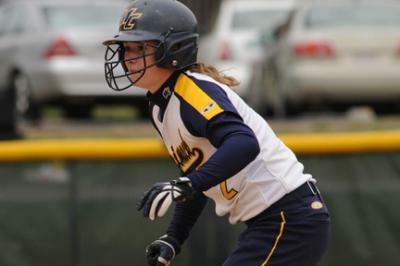 Coach Millett is currently an Assitant Softball Coach at Simmons College (Boston). 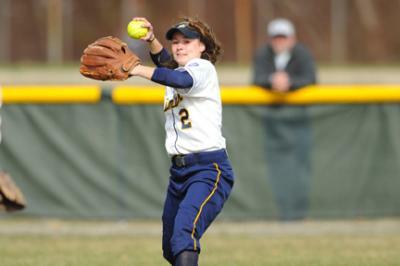 Millett graduated from Merrimack College in 2011 where she played for four seasons. She captained the Warriors in her senior season and helped lead them to an East Regional (1) Championship, 2nd place in the Northeast-10 Conference (NE-10), and first national ranking (#25 National Fastpitch Coaches Association). Millett’s honors include 2010 Northeast-10 All-Conference Academic Team and Merrimack College Athletic Department Honor Roll (2008-2011). She graduated from Hudson High School in 2007 where she captained the town's first ever state championship team in er senior season. In addition, Millett's high school career included two state championship appearances (2006 and 2007), four district championships (2003, 2004, 2006, and 2007), and five Mid Wach C Championships (2003-2007). Her honors include Mid Wach C All-Star (2003-2007), Metrowest Daily News All-Star (2007), and Worcester Telegram Superteam (2007). She is available for individual softball hitting and defense/fielding lessons. 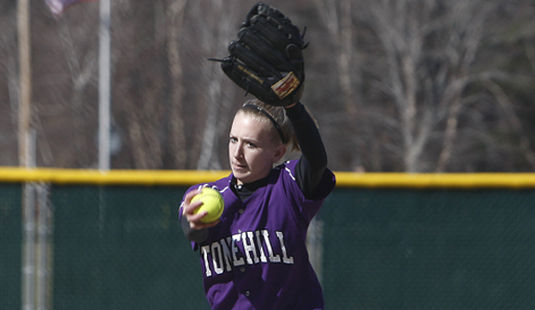 Contact Coach Millett for Softball Hitting/Fielding lessons by calling 978-875-0941 or via . Clinton, MASS (November 14, 2011) -- Charlie Butler (Marlborough, Mass) of Nashoba High School signed a National Letter of Intent with coach Steve Trimper and committed to the University of Maine baseball. Butler, who is 6-foot-4, 240 pounds, is a right-handed pitcher who can also play first base. He will serve as captain of his team this spring. During his junior season, Butler hit .405 with seven home runs and 26 runs batted in. He went 8-2 as a pitcher with 78 strikeouts and a 2.31 ERA in 64 innings. He pitched five complete games. Butler made the Worcester Telegram and Gazette and Metro West Daily News Central Mass Super Teams. He also earned Fitchburg Sentinel All-Star Team honors. He was named to the Boston ESPN All-Stat Team and the Mid Wach-B co-MVP. When he enrolls at the Orono, Maine campus, he'll join up with another Central Mass brethren in former Westborough standout and freshman catcher Fran Whitten. The Black Bears' roster is sprinkled with some Massachusetts lineage, including Mike Connolly (Bridgewater-Raynham), Kevin Scanlan (Lincoln-Sudbury), Steve Perakslis (Abington), Colin Gay (Franklin) and Keith Bilodeau (Bourne). Hall, Brendan. "Nashoba's Butler commits to Maine" ESPNBoston. 10 May. 2011 <http://espn.go.com/blog/boston/high-school/tag/_/name/charlie-butler>. Hall, Brendan. "Baseball Announces 2012 Recruiting Class" UMaine Baseball. 11 November. 2011 <http://goblackbears.com/sports/m-basebl/2011-12/releases/20111111vot2ad>. 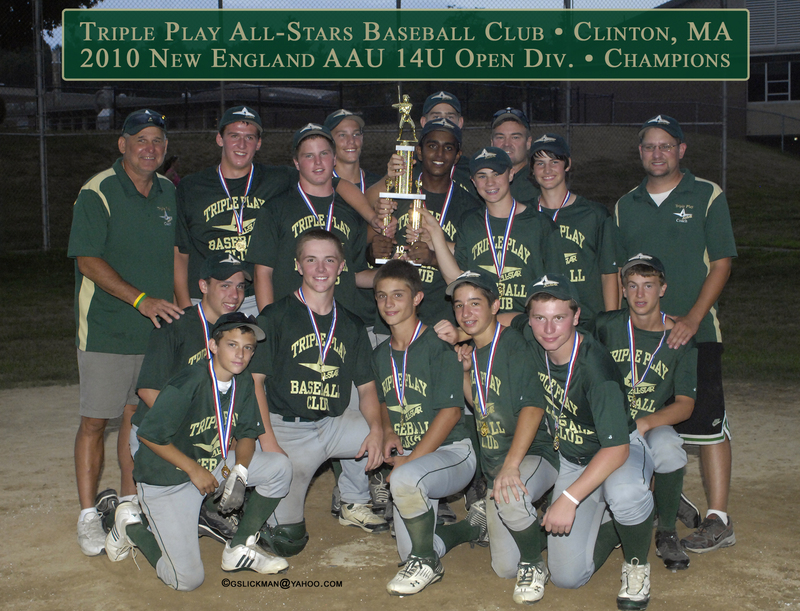 Clinton, MASS (July 20 2010): The Triple Play All Star Baseball Club 14U team won the 2010 NEAAU Championship 14U Game on Monday 7/19/2010. Leading into the championship game, they were 4-1 in the qualifying rounds with outstanding pitching, great defense, timely hitting and great base running. The completed their quest for the championship defeating the Northeast Hurricanes in a thrilling 7-5 win at Nashoba Regional High School. The boys rallied to break a 3-3 tie, scoring 4 runs in the bottom of the 5th. The Hurricanes fought back but good defensive plays squashed rallies in the 6th and 7th securing victory. The victory qualified the team for Nationals in Sarasota Florida. Team members include - Nicholas Borsari, Kevin Connelly and Conor Moran from Bolton – James Adams and Matt Snow from Hudson – Jack Henningson from Northborough – Richard Arms, Michael Baker, Adit Dharampuriya, James Kolenda, Alec Mazursky, Nick Speranzella and Christopher Steidler from Southborough – Rory McHarg from Wayland. The coaching staff is lead by Chuck Schoolcraft Sr with the help of assistants Scott Moran and Chuck Schoolcraft Jr.